Opening Day is a special day in baseball. It’s a sold-out event that signifies that winter is over, warm weather is coming, and baseball is finally back. Some notable stories have been made on the first day of the season. In 1940, a 21-year-old Bob Feller pitched the only perfect game in Opening Day history for the Indians as they beat Chicago at Comiskey Park. Seven years later, Jackie Robinson broke the color barrier at Ebbets Field as a member of the Brooklyn Dodgers. In 1974, Hank Aaron hit his 714th career home run to tie Babe Ruth’s all-time record. But one of my favorite (and most surprising) Opening Day stories is a personal one a friend told me about the generosity of the late George Steinbrenner. Steinbrenner was, of course, not known for his generosity. Quite the opposite. The former Yankees owner was known more for his temper, his incessant meddling ways, and his impossible expectations. Oh, and he was also known for firing his key employees—like “it was a bodily function” to quote George Costanza. From 1973 until his suspension in 1990 (for digging up dirt on Dave Winfield) he went through 19 managers, 13 general managers, and 5 team presidents. There was also the time he hired Billy Martin. And then fired him. And then rehired him. And then fired him again. And again and again and again. Martin went through a total five tours of duty with team Steinbrenner and “The Boss” was reportedly pondering hiring him again in 1989 before Martin died in a car accident. 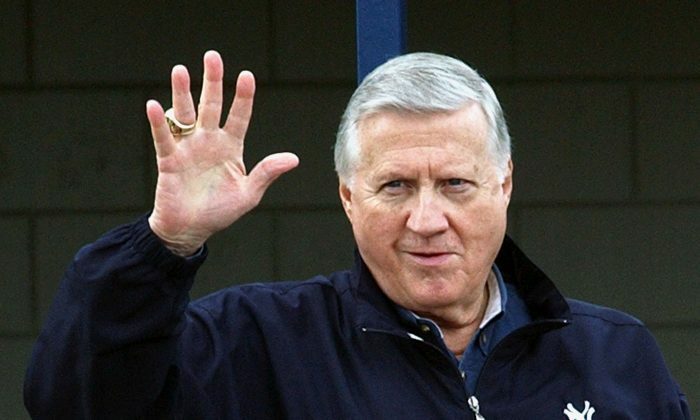 But Steinbrenner also had a softer side that you rarely read about. Until now. A few years back, a friend told me about how he and a friend (then in junior high) bumped into Steinbrenner in an elevator, somewhere in New York City. This was sometime in the late ’70s, just days before Opening Day. “The Boss” introduced himself and asked them if they were Yankee fans (they were) and whether they were going to Opening Day—which was on a school day. They weren’t. Steinbrenner, always one to please his fanbase, offered them tickets if they could find a way to attend (read: play hooky) to which they excitedly said yes. So he pulled out a piece of letterhead paper, scribbled something on it, and gave it to them with the instructions to give it to his secretary and, just like that, the boys got tickets to Opening Day. To this day, my friend stands up for Steinbrenner no matter what. So no matter what we thought of the late Yankees boss, he had a good side to him—even if he encouraged kids to skip school to cheer for the Yankees. To win at fantasy baseball, you have to find some hidden gems in the draft. Who are the biggest sleepers for 2015?